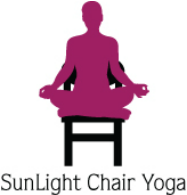 Chair Yoga Teacher Training - SunLight Chair Yoga: yoga for everyone! Please provide the tel # you can be reached the day of the training. Please note if you are a current yoga teacher (if so please list the year and style trained), an MD, OT, PT, nurse, social worker, caregiver etc. and any other info. you would like to provide (why you want to take this training, etc.). ​yogaforeveryone.teachable.com​​Online self paced SunLight Chair Yoga teacher training available 12/20/18! Chair Yoga with Stacie series on cable Marin TV 2019! Click here for more reviews on yelp.com. "Stacie is the most personable, approachable and caring teacher. I love her energy, a true Yogi." "Thank you so much for your knowledge, your experience, your compassion and for your sense of humanity and understanding. The training was amazing, you are amazing. Today you made me a better person. In gratitude, Monica"
"Stacie brings wonderful personal and professional experience to her training. She connects beautifully with all of her students. The information she teaches is extremely valuable." "This training was so much more than I expected. I left the training feeling capable of teaching any group. This is true accessible yoga that brings fun back to everyone's practice." "Stacie presents in a clear and efficient manner. This workshop is information and inspirational. I feel even better equipped to teach this format and help my students improve their physical and emotional health." "This was a fabulous learning experience. Stacie is extremely knowledgeable and easy to understand. She uses great videos and presentations. Her calm teaching manner is wonderful addition to her teaching style. Anyone who has the chance to take this course will reap the benefits many times over. Thank you for your love and light." "I could not have asked more from Stacie. She is the best teacher anyone could have with a thirst for teaching. Everything is possible to her students, so they are as prepared as can be. She is wonderful." "Just finished training in Hollywood Florida. Just awesome and most useful training ever." "I just completed the 2-day (12 hour) Chair Yoga Teacher Training class with Stacie at the Bend and Breathe studio in Hollywood, Florida. Stacie's teaching style is awesome ... she led a class of 12 participants through all aspects of doing yoga in a chair. I had no idea there are so many places where one can teach Chair Yoga. It really is FOR EVERYONE! I highly recommend Stacie's course to certified yoga instructors and therapists. Thank you, Stacie!" "Chair Yoga is NOT for seniors only: read more in Ingrid's blog about what led her to do and teach more Chair Yoga and what led her to my workshop: "By coincidence, one of the leaders in chair yoga, Stacie Dooreck, visited LA last weekend to teach multiple workshops on the topic and without hesitation, I signed up for all of them. Over the weekend, we practiced 5+ hours and just like I suspected, I was feeling that “high” of yoga—peace, inner calm, and a great stretch. When one thinks of senior citizens doing yoga, it obviously doesn’t sound very taxing. What I learned by teaching it, and by studying with Stacie, is that using a chair for support doesn’t at all have to make the practice less strenuous. We tone our muscles just as we do in a regular routine, but if there are handicaps, such as a strained groin, the chair is here to support that. Most of the students in her class were not 55+. They were people who sit at a desk all day and were looking for new ways to stretch their bodies. I cannot begin to explain the new-found freedom I feel by discovering the chair. I was even thinking of creating the phrase “the chair is the new block” for all those yoga companies who make the foam tools to aid in fitness routines.